Securing your personal information on mobile devices is paramount in today’s world. With our phones and tablets containing banking information, credit information, work information and other sensitive content, having that information get into a thief’s hands is a borderline nightmare. While a security PIN or swipe pattern helps, there is one thing you can do that adds another layer of security: Encrypt your device. Encryption is pretty straight forward to do in Android Lollipop and Android Marshmallow if your device isn’t already encrypted. On phones that have Android Marshmallow on them, chances are that it has already been encrypted as that is part of the requirements for manufactures to enable it to deploy Marshmallow. This is one reason why I think that adoption has continued to creep along – but that’s another story. If you have a tablet however, it hasn’t been encrypted and on Lollipop it wasn’t required. 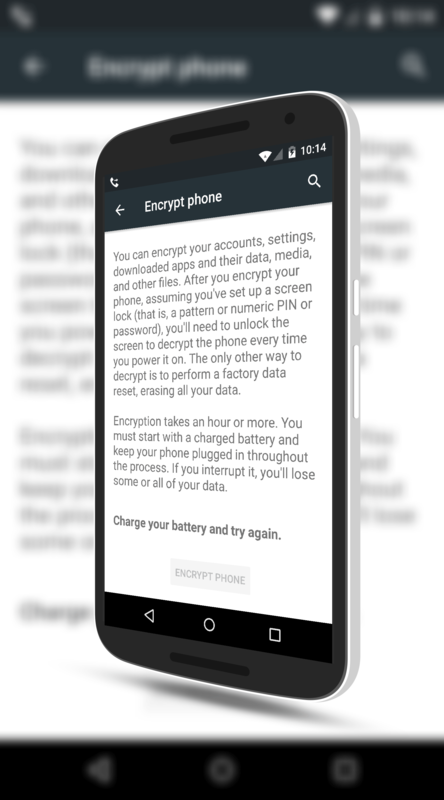 How the encrypt process works in Android is pretty straight forward. It encrypts your entire device – apps, data, accounts, media and basically any other user files – so that a PIN or pattern is required to unlock it. But here is the added juice: If someone got your phone or tablet and connected it to a PC via a USB cable, they could hack the device and get to your sensitive content. If the device is encrypted, they can’t unless they can break a 128-bit AES key. Is it possible? Sure. But we are talking about determent. If a hacker gets your phone and they see it is encrypted, chances are they will simply reset the device (which erases everything) and use it or sell it. In this How To I’ll outline how to encrypt your device for this added level of security. First, plug in your Android Lollipop or Marshmallow phone or tablet and let it charge until your device’s battery is fully charged. The encryption process will not allow you to start it until these two criteria are met. The reason is that the encryption process can take up to an hour and Google wants to make sure your battery doesn’t die in the process. Second, open Settings on your device and navigate to the Security section. In the security section, look for the Encryption section and you will see the option Encrypt phone (or Encrypt tablet if you are on a tablet device). Tap that and you will be brought to the encrypt page that outlines how the process works. When you are ready to encrypt your device, tap the Encrypt Phone (or Tablet) button at the bottom of the page. You will be prompted for your security PIN (or to create one if you don’t have one) and reminded that the process is irreversible and that if you interrupt the process, you will loose data. You will also note that your device will be rebooted several times in the process. Adequately warned, tap the Encrypt Phone button once again to start the process. Your phone or tablet will reboot at this point and you will see the Android boot animation and then you will see the Encrypting dialog screen on your device. You will also see a timer of estimated time left in the encryption process. At this point, leave your device alone! Let the process complete uninterrupted so you don’t lose any data. Once the process is completely, your device will reboot, enter in your security PIN, and use your device as normal. As a general rule, on devices made over the past couple of years, you should see no difference in performance from when your device was not encrypted and now. Some older devices may be a little bit slower but it shouldn’t be noticeable. I have my Nexus 7 (2013) encrypted and performance has been no different than when it wasn’t encrypted. Decrypting a device is done through one simple process: A factory reset. Yep, the nuclear option is the only option you have when it comes to returning your device to a non-encrypted state.